This interesting surname is a variant of MacGowan, which is of Scottish and Irish origin is an Anglicized form of the Gaelic Mac Gobhann (Scotland) and Mac Gabhann (Ireland), patronymics from occupational bynames meaning "Smith". It may also be an Anglicized form of the Gaelic Mac Owein (Scotland), a patronymic from the given name Owen or Ewan, itself deriving from the Greek Eugenios meaning "well-born", "noble". The surname dates back to the early 16th Century, (see below). 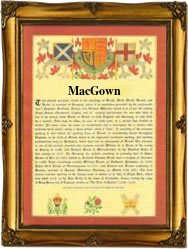 Variations in the idiom of the spelling include McGowing, McGown, MacGoun, Mac Gow, Gowan and Gowans. Among the sample recordings in London are the marriages of John Gowans and Jane Dunbar on September 4th 1770 at St. Martin-in-the-Fields, Westminster, and of George Gowans and Harriot Jane le Tellior on March 13th 1788 at St. Paul's, Covent Garden. The first recorded spelling of the family name is shown to be that of Gilbert Makgowin, which was dated 1526, a follower of the Earl of Cassilis, during the reign of King Henry V111, known as "Good King Hal", 1509 - 1547. Surnames became necessary when governments introduced personal taxation. In England this was known as Poll Tax. Throughout the centuries, surnames in every country have continued to "develop" often leading to astonishing variants of the original spelling.